JBL Boombox is a musical beast. It’s compact in size, but is massive in weight and price. The sound is exceptionally clear, powerful, and intense. Bluetooth wireless audio is robust and accurate, with an enormous line of sight playback range, well over seventy feet in distance. Battery life is gigantic, up to 24 hours, from the 20,000 mAh internal battery that also powers two USB charging ports. The large battery capacity can be used for output, which means the Boombox functions as power pack to charge other devices. Boombox’s design is retro futuristic, with its sweeping handle, mesh rounded exterior, and side-firing speakers. 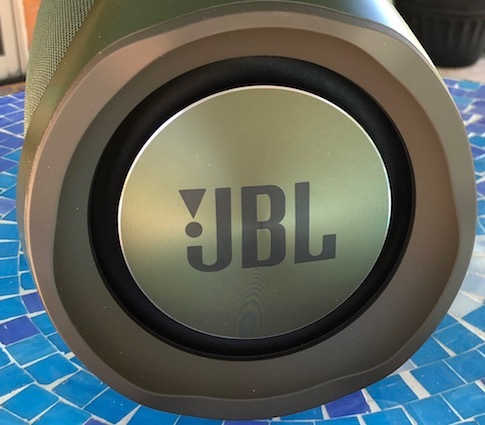 There are no visible controls aside from the power and JBL Connect buttons, the latter (not tested) being for playback through multiple JBL speakers. 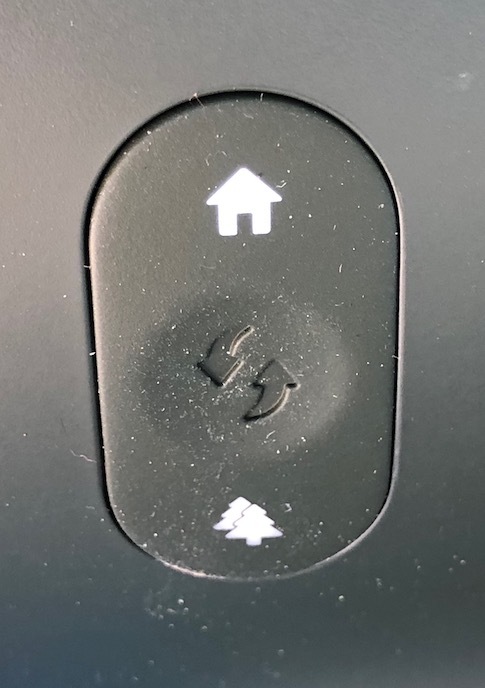 Four subtly embossed additional touch controls are, upon close inspection, for play/pause, volume up/down, and Bluetooth. Most of the time for most users these settings will be done from their source device, such as an iPad or iPhone, which is what I’m using to evaluate this stellar speaker. Did I say this Boombox is heavy? I mean HEAVY, weighing 11.6 pounds or 5.25 kg. It’s easy to carry around for short distances, but you’ll need to hire an Olympic weightlifter to bring it on a hike of more than a hundred yards or meters. It’s also waterproof, but I did not test that. You’ll have to watch the demo video on the JBL web site to see their speaker tossed into a pool. There is only one built-in equalizer (EQ) setting, on the lower rear of the unit. It toggles between “indoor and outdoor” sound, with the former being normal audio EQ and the latter having mega-bass output. Adjacent to that switch is a rubber-sealed compartment with power port, audio port, the two USB ports, and a special firmware update port. Make sure the rubber cover is securely in place before you go on any aquatic adventures. Construction of this Boombox is solid, as is expected from a $400 JBL product. (It was originally $450!) The visually-attractive styling, greenish matte black with silver and red accents, enables this speaker to be placed anywhere without alerting the fashion police. Simplicity of controls demonstrate that minimalism is appropriate when most of the functions will be operated remotely from your iOS gear. But how is the sound? It’s fabulous. Bass is smooth, midrange is crisp, and the high end delivers clarity in all genres. The three sonic zones blend together into a seamless audio presence. The side-firing left and right speakers help with stereo effects, which are not in much evidence from the primary front-facing pair of speakers. Instead, you get a 360 degree effect that works wonders both indoors and outside. Audio coloration is neutral, meaning your music sounds as the artist intended. Fifty percent volume level is comfortable for large room or patio listening. That’s what I’m using now while hearing the Voyage compilation of David Crosby’s greater and lesser creations played from my iPhone. Seventy to eighty percent volume is loud enough to fill a medium sized house or a large patio and annoy your neighbors at the same time. Most music sounds best using the normal indoor setting, so the bass doesn’t knock your furniture through the windows. 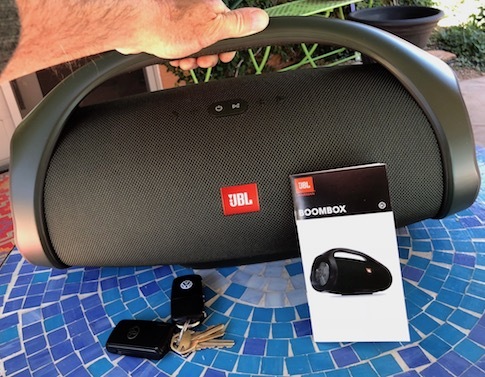 At full one hundred percent volume there is immediacy and intensity to the Boombox experience that will have your party dancing until dawn, with no distortion whatsoever from JBL’s portable powerhouse. That’s what you pay $400 for: big sound at top volume and delicious playback at all levels. Bonus. Boombox Bluetooth works equally well with voice, such FaceTime and phone calls, when you are close enough to the unit to be heard clearly. 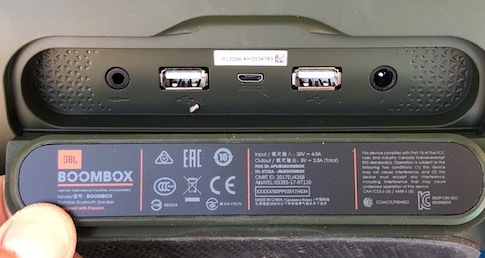 And the the large battery capacity can be used for output, which means that the Boombox with its USB ports functions as power pack to charge other devices. 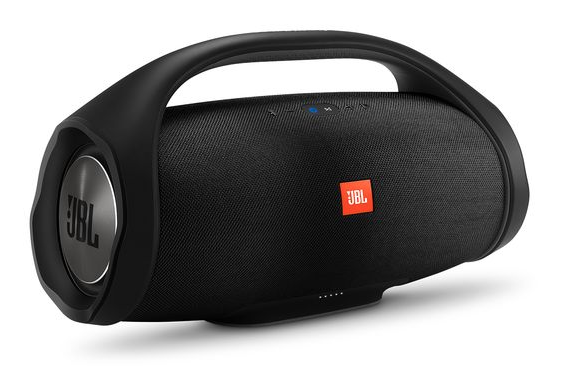 Plus the JBL Sound Guarantee covers shipping and return costs, with lifetime support. I have listened to and evaluated many portable speaker systems. 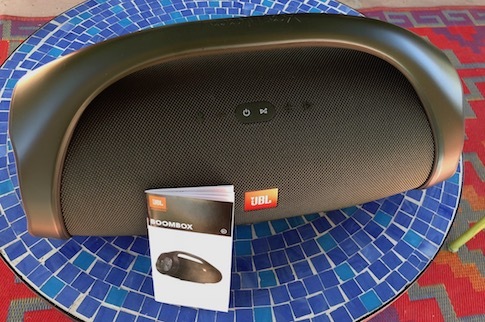 JBL Boombox hits the sweet spot of sound, technology, and appearance. This product is worth saving for, or putting onto your gift wish list. It will become your favorite go-anywhere, play-everything wireless music companion. Do not turn your back on it in a public place, because it will disappear, in spite of its weight. And don’t drop it on a foot or other appendage, yours or anyone else’s! 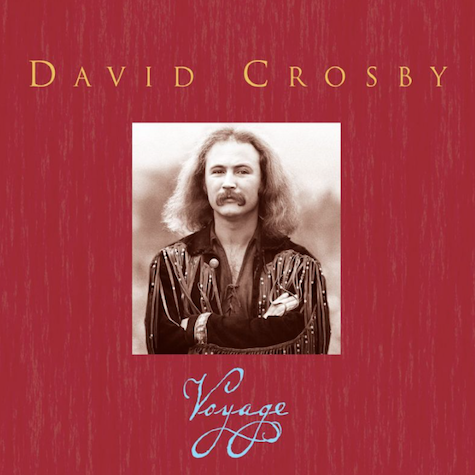 FYI, the best sounding songs on that Crosby Voyage compilation are 2006 remastered versions of the well-known track Deja Vu, from the album Crosby, Stills, Nash, and Young, plus the tune Laughing, from the album If I Could Only Remember My Name. I was not familiar with the latter, and I never paid much attention previously to the former, in spite of hearing it hundreds of times. Deja Vu is amazing in its remastered version played through JBL’s latest and greatest Boombox. 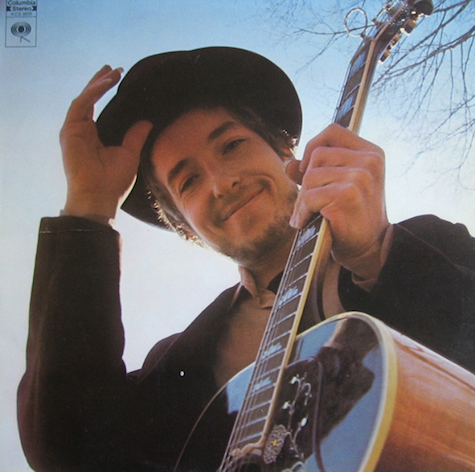 Another classic recording that sounds super-splendid is Bob Dylan’s To Be Alone with You from Nashville Skyline. And a selection from the Swedish group Riltons Vanner, Kyss mig varm from Har ar passion, demonstrates Boombox’s excellent representation of vocal performance, especially the majestic bass and brilliant lead singers. Bravo, JBL. Our MyMac Review Rating is 9 out of 10.